Jefferson City  Governor Mike Parson announced today that the Missouri General Assembly will be called back in for a Special Session concurrent with Veto Session. 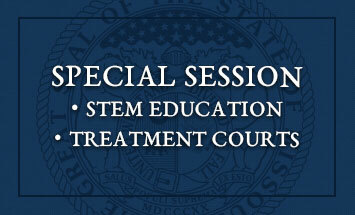 The Special Session will take place the week of September 10-14 and will focus on the passage of computer science course access and awareness of career opportunities through STEM education as well as expanding treatment courts in the State of Missouri. The new STEM education requires Missouri Department of Elementary and Secondary Education (DESE) to establish an online program to educate students about STEM careers and allows for multiple companies to apply to provide the program. By passing this during a special session, it will allow for DESE to start the process of implementing it for the 2019-2020 school year. Senator Doug Libla sponsored one version of the original bill. The new treatment court legislation will focus solely on reforms to treatment courts throughout the state. Expansion of treatment courts will allow for more individuals to get treatment, rather than being incarcerated in our already overcrowded prison system. Representative Kevin Austin was the original sponsor of the treatment court bill. “I applaud the Governor's action and comments. I appreciate his recognition that Missouri treatment courts have been a great success at changing lives for the better, lowering criminal recidivism rates, saving tax-payer dollars by reducing incarceration, all the while making our communities safer and aiding our citizens in their quest to be more productive and improve their quality of life. I am excited to work with my colleagues and the governor to pass this crucial expansion of our treatment courts into law,” said Rep. Austin, R-Springfield. Both leadership from the House and Senate have endorsed the Governor’s decision for a special session. The timeliness of the call to have a special session concurrent with veto session will ensure that this special session is run efficiently, cutting down on any additional costs and saving taxpayer dollars. In addition to legislators, Missouri leaders have spoken up in favor of the upcoming special session. "With tens of thousands of unfilled tech jobs in Missouri, it is more important than ever to make STEM career pathways visible to young people. As an organization that provides free, accessible tech training to Missourians, LaunchCode is proud to support legislation that will open doors to new generations of learners and better prepare them for accelerated, job-focused training programs like ours," said Jeff Mazur, Executive Director, LaunchCode. "We are grateful to Gov. Parson and legislative leaders for making STEM career awareness an urgent policy priority." “Treatment courts are the most successful intervention in our nation’s history for holding accountable people living with substance use and mental health disorders, and leading them out of the justice system into lives of recovery and stability,” said Judge Alan Blankenship, 39th Circuit Court and President of Missouri Association of Treatment Court Professionals. Though vetoed during the regular session due to problematic language that had been added, both received strong bipartisan support, and Gov. Parson reiterated that this special session is about agreement not division.